Very cool and very unique image. Great work Nathan. This photo was taken of the beach in divers cove, Laguna beach. I believe it was around 11 am. We were out diving for about 4 hours so hard to remember the actual time with out the metadata at hand. The was taken with natural light just positioned the diver so the sun was coming in at a side light. 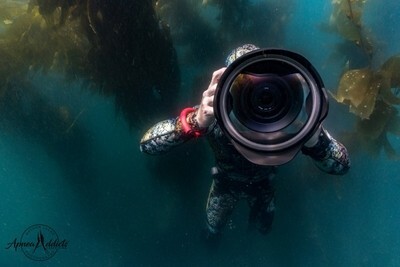 I was using the cover of the kelp as a diffuser. I really wanted the light to capture the rainbow effect the dome produces at the right angle.... worked beautifully. This was shot in the Sony a6000 with the touit 12mm zeiss lens Locked tight in a nauticam housing and a 180mm dome port on the front. The same camera you see here in the pic. I teach and dive with a bunch of Spearfishermen. This shot was taken in a nature preserve, and i wanted to show case to my students how beautiful it can be to leave your guns at home and just enjoy the environment. It also helps to have a camera because it’s very good at refining your hunting techniques. The same techniques are applied to capture an image of a fish, as it is when hunting them.... i find the pics even more rewarding because it’s much harder to get close enough for a shot, and they last forever. Yes, very minimal post processing tho. I removed a few unwanted bubbles and just mildly adjusted contrast tones and clarity to even out the white balance. Doing underwater photography you loose the colors red and orange in the first 4 feet. Especially freediving, where you change your depth constantly, it’s hard to adjust for the correct color. So shooting raw is a must so you can perfect it in post. This shot was taken on my old underwater set up. Now i shoot with the a7riii and the A7iii. I have a quiver of lenses. 18mm, 24mm, 34mm, 50mm, 85mm, 90mm macro, 105mm portrait, and a 70-200. Lighting i use godox 600, ad200, 860ii. I use Stella led lights for low light conditions or underwater and i also have underwater strobes 2- inon z330 strobes. My housing of choice is always nauticam. Before attempting to FreeDive, take a class and learn proper safety and technique. Become a better diver and you’ll become a better photographer. Also learn to shoot completely in manual and you’ll start crafting your shots like a painting. Hope that helps. Please feel free to DM me. I’m all about helping the community. So if ya have a question about shooting, posing, lighting, led vs strobes, diffusers etc. please don’t hesitate to reach out.... cheers guys!